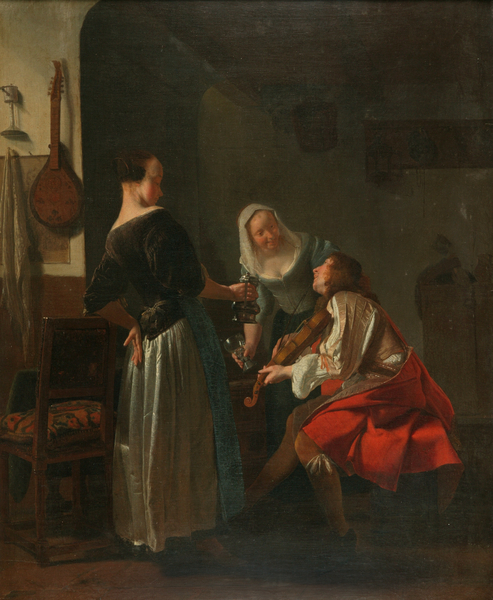 In this tavern scene, a violinist seduces two serving girls with his music. A lute is hanging prominently on the wall to the left; music was often associated with love and was frequently depicted in Dutch genre painting. Ochtervelt brings his figures to life through the use of expressive faces and hands, which are carefully lit to lift them from the shadowy background. The light also accentuates the graceful curve of the maid's bare neck and shoulders, drawing the eye downwards to her arm and the lustrous material of her dress. Paintings such as this were made for the open market and Ochtervelt re-used models and formats that sold well. Ochtervelt was a painter of high-life interiors who particularly favoured themes of flirtation and love. Many of his genre scenes show domestic interiors belonging to wealthy burghers. The source for this work has been identified as Inn Scene, 1658, by Frans van Mieris, but the frank sexual allusions have been replaced by a more nuanced narrative, such as the fact that there are two servant girls here.